Aloha! 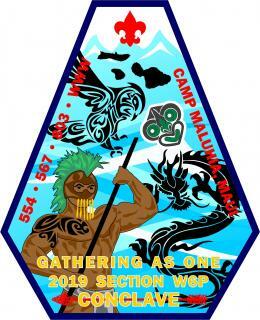 Get ready for the Section W-6P Conclave to be held on the beautiful island of Maui at Camp Maluhia. The Conclave is an annual gathering for all Order of the Arrow members from Hawai‘i and across the Pacific, bringing together Scouts and scouters from Achpateuny Lodge of the Far East Council, NÄ Mokupuni O Lawelawe Lodge of the Aloha Council, and our host Maluhia Lodge of the Maui County Council. This year’s Section Conclave is scheduled for April 12-14, 2019 and will be held at Camp Maluhia on the windward slopes of West Maui. Maluhia offers spectacular mountain and ocean views with cabins and bunk beds for lodging. The registration fee of $80 includes lodging, meals, and one Conclave participant patch. Conclave shirts are an additional fee, so be sure to select the amount and size of shirts desired when registering. Arrowmen should pack a sleeping bag and/or bedding for the cool nights. Also, be sure to check out the Conclave packing list for other items to bring. The Conclave program seeks to increase the knowledge and understanding of the delegates in all aspects of the Order of the Arrow program and have fun. This is a great opportunity to meet your fellow Arrowmen from Section W-6P along with the newly elected 2019 Western Region Chief Antonyo Mitchell. You won’t want to miss this opportunity to fellowship with and learn from a National Officer! Through the Conclave, Arrowmen should be inspired to set and commit themselves to higher goals of performance for themselves and their lodges. Having fun with your fellow Arrowmen and sharing experiences at Camp Maluhia is an event that you will never forget. There will be shows, indoor and outdoor activities, and Section Chief Michael Perry is planning an all-night event for Saturday night that you won’t want to miss (you don’t need any sleep!) All kinds of fun activities are on the schedule, you just need to register as soon as possible to reserve your space at the premier OA event of the year. All Arrowmen must register no later than April 5 by clicking the Register button (in the upper right section of this page). Additional information is required so arrangements can be make for transportation, lodging, food, dietary and medical purposes. Please provide this information by clicking on this link: https://goo.gl/Q5U8cc. All Arrowmen must arrive in their Scout uniform. All Arrowmen must bring a current copy of their BSA Health Form, Parts A and B, with them. Finally, a Section Election will be held to elect the Section Chief, Section Vice Chief and Section Secretary. In order to run for office, you will need a document saying the position(s) you intend on running for and written (paper, email, etc.) approval by your respective Scout Executive or his designated representative. You will need to be under the age of 21 during your entire term of office. Those elected at this Section Election will have the opportunity to attend the Western Region's Section Gathering in Portland Oregon, October 25-27, 2019. The Section Chief represents all Arrowmen in Section W6P (Achpateuny, Maluhia and NÄ Mokupuni O Lawelawe Lodges) and represents us in the Western Region of the Order of the Arrow. The Section Chief travels to the Western Region Gathering in Portland, Oregon as well as the National Planning Meeting in Dallas, Texas in December. The Section Vice Chief and Secretary have been invited to the past Western Region Gatherings and we anticipate that they will be invited again. There will be a Trading Post and Silent Patch Auction, so be sure to bring extra money, as you will get an opportunity to buy Scouting items you will not see again. We will be auctioning off a set of the entire set of patches that includes a conclave patch from each of the Western Region Sections. Early Bird Registration of $75 by March 1st, 2019. The first 25 Arrowmen to register will receive a special OA gift. If you have any questions, please contact Conclave staff at Conclave2019@sectionw6p.org.